Our student Rebecca Slimming sent us this beautiful e-postcard all the way from Zurich, Switzerland. Her rave report of her exchange at the University of Zurich so far had everyone in the Global Learning office beaming. We’re always thrilled to hear from students who are having a wonderful time abroad! Thank you for your emails. I would love to update you on my overseas travels and thank you for this incredible opportunity studying abroad. 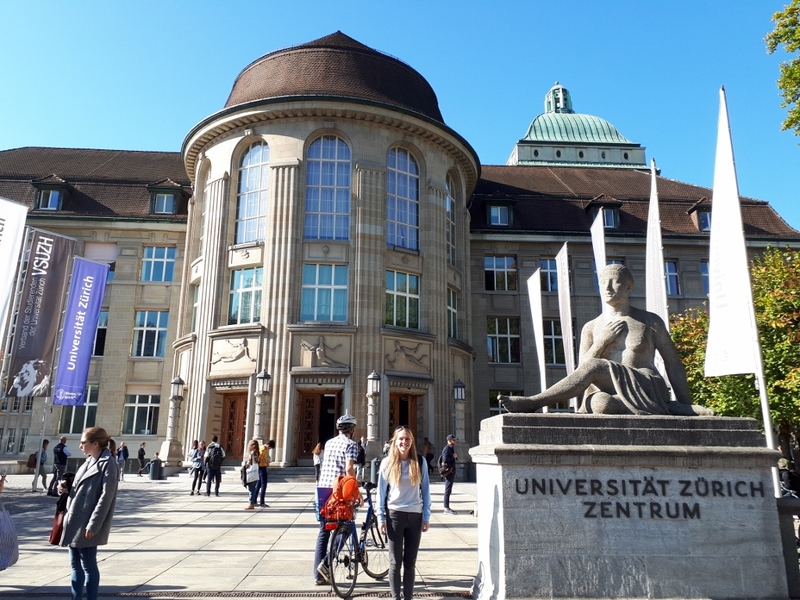 I am currently living in Switzerland, studying International Law at the University of Zurich and could not be happier! I am in my 5th Week of Uni now and have already experienced so much and cannot believe how quickly my semester is flying by. The University of Zurich was build in 1883 and the old buildings are absolutely beautiful. I have attached a picture from today of me standing out the front on the main University building, it is just stunning! Similarly, the Law library is a work of art. The exterior of the building was built in the 17th Century but the interior was recently renovated to create a library with 5 levels allowing over 500 study spaces and an amazing architectural design. The University itself has over 50 libraries in total so there is no shortage of finding a nice place to study. Though the weather has been so lovely lately that I have been wandering through the medieval old town (5 minutes walk from uni) and studying on the riverbank overlooking some of Zurich’s oldest and ornate churches and clock towers! I love the Swiss way of life. Despite there being over 400 different types of cheese and the most delicious chocolate you could ever imagine, people over here are so healthy! Every week I have over 100 different gym classes / sports / outdoor activities available to me all for free! There are 5 University gyms which students have full access to for free. They really encourage physical activity and I am loving taking part in all of it. 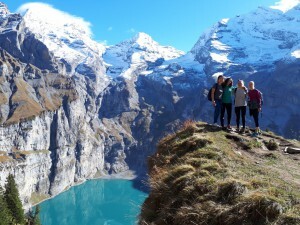 I have joined a social running club and participated in organised hikes with groups all around Switzerland. I have thoroughly enjoyed seizing every opportunity to see so much of this beautiful country. I will send a picture of one of the many beautiful lakes I have observed on a group hike also. As for the study at this famous institute, I am constantly in awe. I have the privilege of being taught by professors from all over the world who have studied at Harvard, worked at the Hague and lived and worked in all different legal jurisdictions. I have found everyone at this University, both teaching staff and students, helpful and so kind. I have never felt lost because from day one I had a supportive network. I was also given a buddy at the law school and we have caught up at various events.There are multiple events every week for exchange students – ranging from pub nights, international dinners, hiking trips, parties, and excursions – I can’t believe how lucky I am! I am currently also undertaking a German course this semester, offered by the University which is free for any students who want to learn. Fortunately all of my law courses are taught in English (because my German is ‘nicht so gut’!) but I am enjoying learning some basic German skills to help me get around a bit easier. On weekends I have been able to travel around Europe as well are around Switzerland because everything is so close. Last weekend I popped over to Italy to see Milan and I made it to Munich for Oktoberfest last month which was certainly a wonderful experience. I have been blessed with amazing weather as well for the past 2 months that I have been away. Prior to beginning University, I took the opportunity to travel around the UK for a month which I also thoroughly enjoyed and would not have done had I not embarked on this exchange. I have plans for a white Christmas in Austria this year, with my boyfriend who is coming over from Adelaide to meet me, so that will get me through the hard slog of exams! I keep waiting for the downhill culture shock to kick in as you warned it would, but I am just having way too much fun and being kept too busy to notice, I think! I certainly do miss home – I just wish I could share this incredible experience with my friends and family because pictures just don’t do this justice! I’m sure the reverse culture shock will be much worse! There is so much more I could report and if you have any questions, I am more than happy to answer them for you. I could not recommend an exchange semester more highly. The people that I’ve met, the places I’ve seen (and continue to see), and the opportunities I have been given and grasped have all played a role in shaping the more cultured and open-minded person I have become. Thank you, sincerely for making this experience possible and for all you have done in the lead up to and during my exchange. Your hard work and support doesn’t go unnoticed and I will be forever grateful. This entry was posted in Europe, Exchange, Faculty of Professions, Law, Switzerland and tagged academics, architecture, buddy, cheese, chocolate, culture shock, events, Exchange, exercise, Faculty of Professions, German, gym, hiking, housing, Law, libraries, Oktoberfest, professors, recommendation, study, Switzerland, travel, University of Zurich, white Christmas. Bookmark the permalink.